I can’t stand to have any kind of smudges on my glasses. Some worked ok. Some were terrible. I had one that was pretty good but it was tiny. The problem I always have is that either the cloth leaves streaks on my lenses or it leaves tiny little lint particles that tend to blur my view. I found a microfiber cloth that was meant for LCD televisions and it worked pretty well. It still left a little lint and some minor streaks but it was the best I could find. I just lived with it. One day I was in the dollar store and I noticed a glass-cleaning microfiber cloth that was for auto glass. It looked more like a polyester cloth instead of a fuzzy felt-like microfiber cloth. I bought one and to my surprise, it worked better than any of my “fuzzy” microfiber cloths. It was my new favorite eyeglass cleaning cloth ! I was working on the formula for my alcohol-free eyeglass cleaner and I noticed that my auto-glass microfiber cloth was not working as well with the alcohol-free solution as it did with the alcohol cleaner. I needed a better cloth. I got back on the internet and did some more research to find the best microfiber cleaning cloth. I knew that the extra-fine weave of the auto glass cloth was the reason it performed as well as it did. With that in mind, I then stumbled upon this ultra-fine microfiber cleaning cloth. This cloth looked like it had an extremely fine weave, almost like satin. I bought some of these cloths and I can report that they do indeed live up to the high praise given by the many people that have bought them. I prefer the large 16×16 microfiber cleaning cloths. The larger size makes it easier for me to clean my reading glasses. I also use them for cleaning my LCD/LED TV screens, CDs, DVDs, Blu-ray discs, and also my home-theater projector lens. This first photo shows a standard microfiber eyeglass cloth next to the ultra-fine microfiber cloth. In this close up, you can see that the standard cloth looks like a shag carpet compared to the tight micro-weave of the ultra-fine cloth. 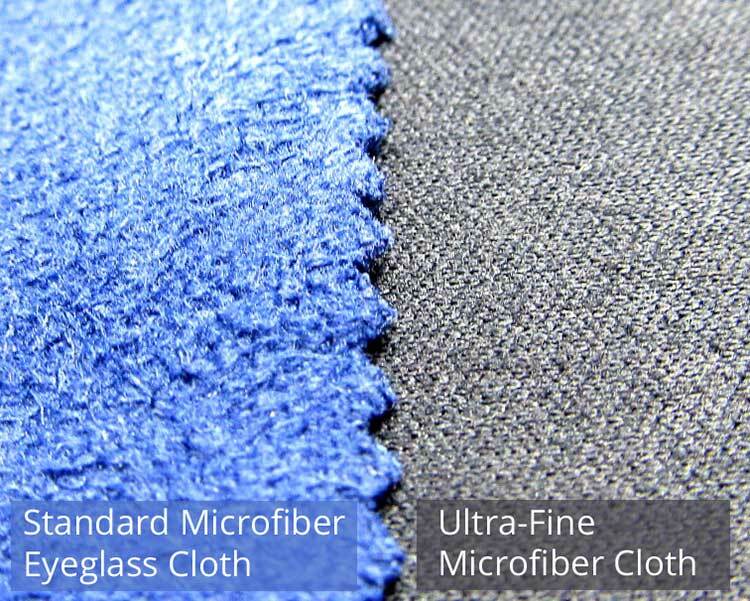 Notice how the standard eyeglass cloth looks like a shag carpet next to the ultra-fine microfiber cloth. The second photo shows the auto-glass microfiber cloth, the standard eyeglass cloth, and the ultra-fine microfiber cloth. Notice that the auto-glass cloth has a zigzag weave. This helps it to clean glass better. The standard cloth doesn’t have a patterned weave. Again, it is much like a shag carpet, just in miniature. But notice the ultra-fine microfiber cloth. It has an organized weave, but it is much smaller than the auto-glass cloth. 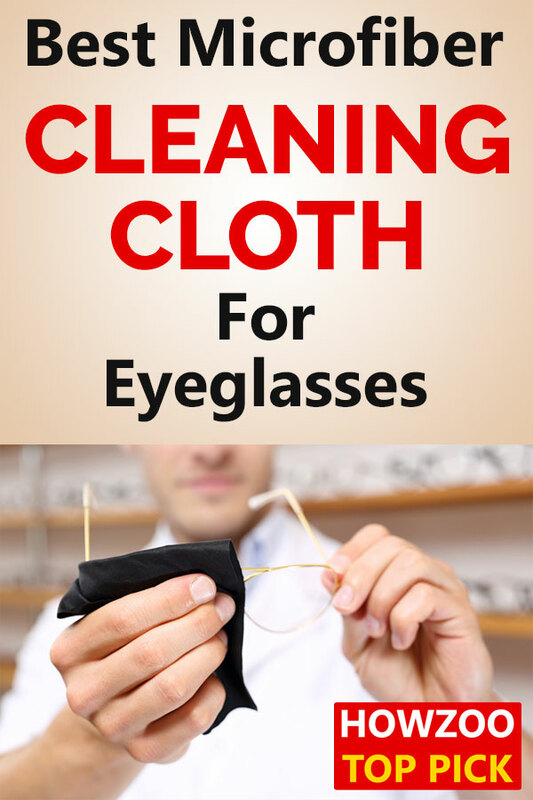 I believe this is one of the reasons that it performs as well as it does on eyeglasses and lenses and makes it the best microfiber cleaning cloth. Notice how the auto-glass cloth has a zig-zag herringbone weave. That weave is what makes it good at cleaning glass. The ultra-fine microfiber cloth also has a similar weave pattern but it is much smaller. A smaller weave is better for precision cleaning of optics and lenses. Great article!!.. Magicfiber the best!! What local stores carry these cloths? As far as I know they can only be purchased here . I have never seen them in a local store. Excellent article – thank you. Have never been that happy with any spectacles cleaning cloth as they all seem to leave smears and like you, I can’t stand anything other than completely clear . . . I’m now expecting great things and will update on receipt in about three weeks time. Thank you so much for this article. I recently bought a new pair of eyeglasses. My first in 5-6 years. They are $500 and I want to make sure they stay unscratched as long as possible. I’m sure this will help. Yes you will find that this type of cloth works better than the “fuzzy” cloths. To keep them unscratched, the very best way to clean them is in the sink using alcohol-free homemade eyeglass cleaner. I will say though that I have a pair of $120 prescription readers that have polycarbonate lenses. They do not have any coatings. I have been cleaning them at my desk for years with an alcohol-based spray and they have not been scratched. But I also have a pair of $400 coated, progressive-lens glasses that I only clean under the sink with alcohol-free cleaner. Love your suggestions, Jeff. Do you notice any affect by using these cloths since they are black in color? Wish they carried white ones. I have not had any problems with the black cloths. I do suggest that you don’t use fabric softener or dryer sheets when you launder these. Such laundry additives will contaminate the microfiber cloth and harm it’s performance. Dude, I am excited to try these suggestions! I found the Micro Fiber on Amazon in the 16 X !6 size, and along with the the spray cleanser, these will make awesome gifts for my fellow vision challenged friends. Thank you much! I will be checking your other home hints. With Gratitude! Why do doctors give us glasses cloth? They probably do so as a courtesy, the same as when a burger place gives you a pack of ketchup. Their cloths are nothing special. what is the name of this ultra fine cloth where can i buy?? I believe there is more than one brand selling the same cloth. Click on one of the blue links up in the article to go to the brand I currently use. The links are affiliate links as described in my Disclosure Policy. Can you wash the cloths? Yes but don’t use any fabric softener or dryer sheets. Those things will leave a residue on the cloth that will hinder it’s effectiveness. The packaging says to hand wash with warm or hot water only. Use no detergents or fabric softener as it will render the cloths ineffective. This knitter sees a photo that shows knit fabrics versus woven fabrics. 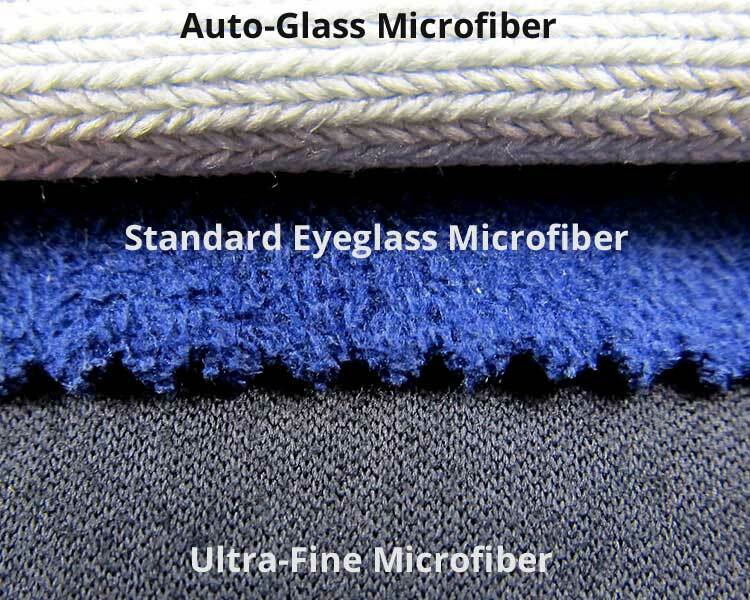 The auto-glass microfiber and the ultra-fine microfiber are clearly KNITS. Really love Clearlens cloths too. They have a variety of textures to fit preferences. Got them at my optometrist and keep going back just for those cloths! Thank you so much!! I’ve been struggling with horrible cleaning cloths and filthy, smudged glasses for forever!! I was ripped off with junk cloths more than once. Even the cloths that came with my glasses were ineffective. I found your article and followed the link yesterday. They were delivered today and work like magic!! This is the cleanest my glasses have been in too long. I can see again!! Thanks for doing the legwork and sharing your amazing find.